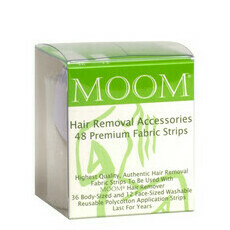 The MOOM Express Wax Strips for Leg & Body effectively and gently remove hair right from the root, keeping your skin feeling smooth, soft and free from irritation. Enriched with Chamomile and Lavender, which help to soothe and calm the skin, the resin strips are easy to use and keep hair away for up to two months. Complete with a Cucumber and Jojoba finishing oil, the strips are suitable for those with sensitive skin. 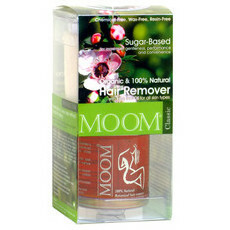 All MOOM products work by 'glazing' the hair, rather than waxing. 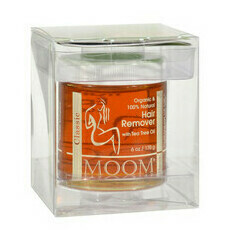 The formula sticks to even the most stubborn hairs, but does not adhere to the skin. This minimises skin irritations, making it the most pleasant from-the-root hair removal option. Made in Canada, Certified Cruelty-free. Glyceryl Rosinate, Elaeis Guineensis (Palm) Oil, Cera Alba (Beeswax), Chamomilla Recutita Extract, Caprylic/Capric Triglyceride, Helianthus Annuus Seed (Sunflower) Oil, Lavandula Angustifolia (Lavender) Extract, Pentaerythrityl Tetra-di-t-butyl Hydroxyhydrocinnamate. To really work that well. I followed all the instructions. Smelt nice though! These strips didn't wow me, to be honest I found the experience to be on par with other brands I have used. I still got red bumps on my legs which stung even after following the instructions carefully. Also the strips really didn't pick up all of the hair, very patchy. The finishing oil is absolutely divine though! Won't be repurchasing despite having high hopes for this product.